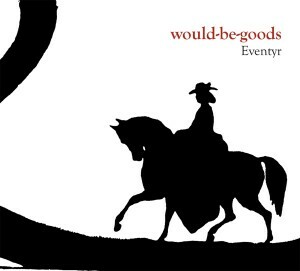 Highly anticipated fifth album ‘Eventyr’ from revered London quartet Would-Be-Goods is released 20 years after the classic debut album ‘The Camera Loves Me’ on ‘80s cult label èl Records. It is their third album for Matinée, after the well received ‘Brief Lives’ (2002) and ‘The Morning After’ (2004). “Sad stories are more beautiful” sings Jessica Griffin on the opening track, and those words could be the motto for the album as most of its songs are inspired by folk tales—timeless archetypal stories composed in northern Europe in the 19th century. ‘Eventyr’, meaning ‘adventures’ or ‘fairy tales’, was the title of Hans Christian Andersen's classic collection of stories, and in songs such as ‘Melusine’ and ‘Heart of Tin’, the Would-Be-Goods show that tales of imagination can evoke the joys and sorrows of life more vividly than dreary realism. Some of the songs stay closer to home: ‘In Bohemia’, ‘The Girl at No. 7’ and ‘The Ghost of Mr. Minton’ depict the arty low life of midcentury London to magnificent effect. Musically, though, ‘Eventyr’ is not a folk album: the songs distill ‘50s and ‘60s styles into something entirely new, traveling through baroque pop, bossanova and rockabilly. The album was developed slowly over two years and sees Andy Warren—formerly of Adam and the Ants and The Monochrome Set and bass player on the first two Would-Be-Goods albums—return to join Debbie Green on drums and backing vocals, Peter Momtchiloff on lead guitar, and Jessica on lead vocals and guitar. Another classic album from a band that never goes out of style! Qualche giorno fa sul sito della Matinée é uscito un comunicato stampa da commuoversi: un nuovo disco dei Would-be-Goods. Tanti anni fa inciampai sul loro The Camera Loves Me, datato 1988, e me ne innamorai perdutamente. E' quel pop troppo educato e composto e soprattutto elegante per essere catalogato C86, anche se gli anni erano quelli e gli ascolti pure. La perfezione dei ritornelli a metà tra bossa rockabilly e pop anni 50, il sound impolverato, quella voce femminile con una pronuncia severa mi fecero impazzire, e ancora oggi capita qualche volta che la domenica non riesca ad alzarmi senza ascoltare almeno una volta Cecil Beaton Scrapbook. Il nuovo album si chiama Eventyr ed é uscito per Matinée il 28 Ottobre. Ci sono già un paio di tracce nuove ascoltabili sul myspace, e mi sembra che la mira al cuore di Jessica Griffin e soci sia sempre perfetta. --Frigopop!